One year ago we first met the children of Sunneh village. CPT Iraqi Kurdistan visited them in Gojar camp where they fled with their families during the insistent shelling of the summer and autumn of 2011. Their school had been damaged by the neighboring country’s military bases sitting high up on the mountain ridges overlooking the village. We heard stories of children waking every night with nightmares. Their faces and minds were stressed from life in the tent camp. 20 November, 2011 was the celebration of International Children’s Day. UNICEF organised a commemoration at the school. They wanted the children to know they had not been forgotten. The damages to the building had been repaired, and it had a new coat of pink paint. 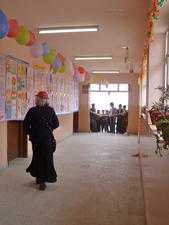 The walls inside the school were decorated with balloons, tinsel and many drawings and paintings by the children. The striking thing was that many of the drawings showed signs of what the children had experienced in the previous months. There were planes and helicopters dropping bombs onto small villages. One showed a small animal running from the shells. Now move forward to November, 2012. CPT Iraqi Kurdistan has kept in contact with the school. We have shared their stories in the form of a report and a video. Many of the students recognize the team members and look forward to our monthly visits. This summer their lives have been free from running from bombardment. For an unknown, but welcome reason, Iran and Turkey have allowed the villagers to live a normal life throughout the entire growing season. Gardens were planted, grew and were harvested. Goats and sheep were pastured. Children gained another year in age and grew in maturity. The school was decorated again. The balloons and tinsel were back. 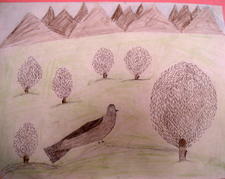 So were the artistic talents of the students. As the team admired the paintings and drawings something new was striking. The art depicted village life: the mountains, the big sky, the herds of animals, planting and harvesting, playing and living. Not one showed a bomb or a shell. The only evidence of a plane was a large passenger jet with lots of round windows for people to look out of. The young students were joyous and danced and celebrated just being children. For this minute in time the children of Sunneh and their parents are able to live under their vine and fig tree without fear. Our prayer is that this will be forever. However, the new white trailer Internally Displace Persons camp still waits just a little way down the road. And on November 8, in the same Pishdar region, two Kurdish civilians were killed and 2 wounded by Turkish planes far inside the Iraqi Kurdistan border.